2012 is shaping up as an election in which the winner may earn victory not by virtue of winning the most votes, but on account of the Electoral College. If one candidate enjoys a popular vote edge of 2 percentage points or more, there’s virtually no chance that the other candidate will achieve a majority of the electoral votes. But given how close the election seems this year—average the six national surveys conducted since mid-August, and you get 46.5 percent for Obama and 45.5 percent for Romney—the final results may not be so clean cut. If the Electoral College does come into play, on what will the outcome hinge? As we head toward to Republican convention, here’s a late-summer assessment—not so much a prediction as a viewer’s guide to the fall contest. Let’s begin with the Electoral College foundation on which each candidate will build. 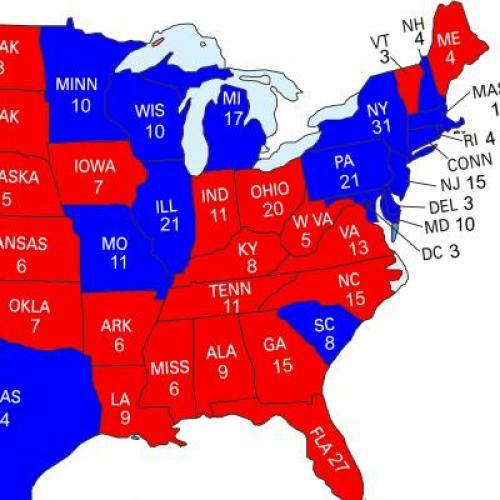 A very conservative assessment gives Obama a base of 201 electoral votes, and Romney 181. These numbers exclude one state—Pennsylvania, with 20 electoral votes—that most observers are putting in Obama’s column, and one state—Missouri (10)—that is likely to go for Romney. Factoring in these probable outcomes, Obama’s base rises to 221 electoral votes, Romney’s to 191. The next tier contains three states that Romney must win and two more that Obama must hold. The Romney 3 are Florida (29), North Carolina (15), and Ohio (18), in each of which Obama’s share of the popular vote in 2008 was well below his national share. No Republican has ever won the presidency without Ohio, and Romney is unlikely to be the first. There’s no road to 270 electoral votes for the Republican ticket that doesn’t run through Florida. And losing North Carolina, which Obama won by only 0.3 percent, would force Romney to flip a major Midwestern state where Obama won by a much greater margin. Let’s look more closely at Ohio. During the past five presidential elections, the Democratic candidate’s share of the state’s vote has trailed his national share by an average of 1.3 percentage points. 2008 was no exception: Obama received 52.9 percent of the national vote, versus only 51.4 percent in Ohio. But so far, 2012 looks different: the six most recent Ohio surveys give Obama an average of 47.2 percent of the vote—0.7 points more than his national share. Relative to the historical benchmark, then, Obama is outperforming in Ohio by two percentage points—enough to win the state even if the national vote is very closely divided. Memo to the Romney campaign: whatever you’re doing in Ohio isn’t working. And if you don’t turn it around, your only chance is to make history in the upper Midwest. This is where things get interesting. The Obama 2 are Wisconsin (10 EVs), which Obama won by 14 points in 2008, and Michigan (16 EVs), where he prevailed by more than 16. Polling this year has long indicated much closer races in these states, and the selection of Paul Ryan seems to have contributed to the statistical ties shown in the most recent surveys. Winning either of these states would be a game-changer, broadening Romney’s options for reaching 270 electoral votes and narrowing Obama’s. But for simplicity’s sake, assume that each candidate does what he must, with Romney taking Florida, North Carolina, and Ohio while Obama turns back the Republican assault in the upper Midwest. If so, Obama would have 247 electoral votes; Romney, 253. And five states would be left to decide the contest: Virginia (13), New Hampshire (4), Iowa (6), Colorado (9), and Nevada (6). Obama won all five in 2008, four by margins exceeding his national margin, the fifth (Virginia) with slightly less. To understand the options, let’s start on the east coast and move west. If Romney were to win Virginia and New Hampshire, he’d be on track for 270 EVs and could afford to lose Iowa, Colorado, and Nevada. If he took Virginia but lost New Hampshire, any one of the remaining three states would put him over the top. If he took New Hampshire while losing Virginia, he’d need Colorado plus either Iowa or Nevada. If he lost both, he’d need all three. It’s a little different for Obama. Assuming that Obama had 247 EVs from the 45 states already accounted for, Virginia and New Hampshire together would bring him to 264, so he’d need one of the remaining three. If he took Virginia but not New Hampshire, he’d need two of the three. If he took New Hampshire but not Virginia, he’d need all three. If he lost both, even winning Iowa, Colorado, and Nevada would leave him with only 268 EVs, two short of a majority. All of this is speculation, of course, but not unfounded speculation. My allocation of the initial 45 states between the two candidates is consistent both with current survey findings and with the contours of Obama’s performance in 2008. This scenario means that we’re likely to know quite a bit about the outcome fairly early on election night. If Romney loses Florida, the contest is over. If Obama loses Virginia, he needs to run the table. And if he goes down to defeat in both Virginia and New Hampshire, he’d be on track to lose the election—unless he could replace their electoral votes by hanging onto North Carolina. If not, Obama’s reelection would hinge on the most traditional of all pivots—the Buckeye state. This year, we may well know the name of the next president before we cross the Mississippi. William Galston is the author of Anti-Pluralism: The Populist Threat to Liberal Democracy.